What a terrific idea! 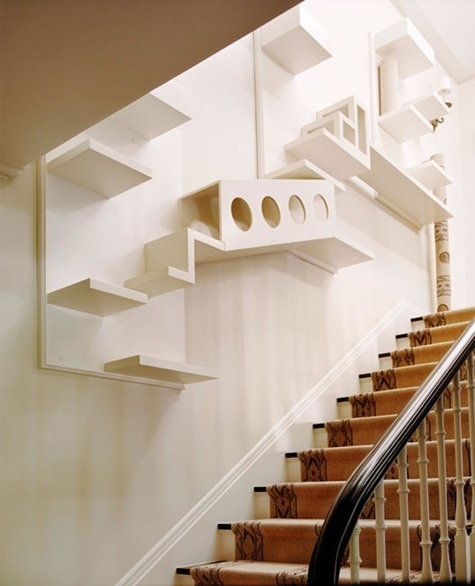 Here is a wall mounted kitty jungle gym. Our kitties are now gone but wouldn't this have been fun. I need to save the idea for the grand kitties! The DIY possibilities are huge! I LOVE it. Although I think I would put a thick piece of plexiglas in part of the bottom of boxes at the top near the ceiling so if I went looking for my cat I'd be able to tell if he was napping and ignoring me in his cozy box.